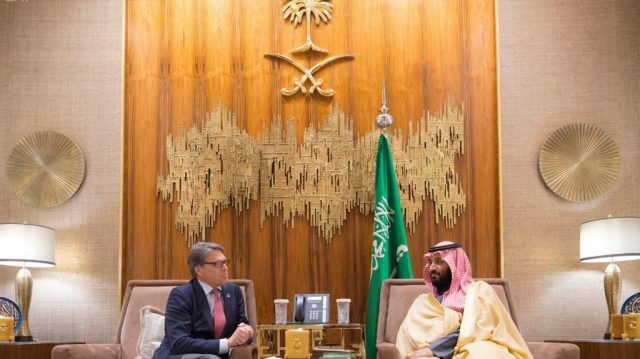 “Not only are we not interested in any way to diverting nuclear technology to military use, we are very active in non-proliferation by others,” he said at a joint news conference with US Energy Secretary Rick Perry. “We hope that the two paths will converge – the commercial, technical discussions between KACARE and the American companies, while we work with our counterparts on the American side to address the regulatory and policy issues,” Mr Al Falih said. Mr Perry, who is on his first official visit to Saudi Arabia and will go on to the UAE and Qatar this week, said it was “a bit premature” to comment on the negotiations. Washington usually requires a country to sign a peaceful nuclear cooperation pact – known as a 123 agreement – that blocks steps in fuel production with potential bomb-making uses. Riyadh wants eventually to install up to 17.6 gigawatts of atomic capacity by 2032 – or up to 17 reactors. This is a promising prospect for the struggling global nuclear industry and the United States is expected to face competition from South Korea, Russia, France and China for the initial tender.